Late May to early July. Rides and glades with wood sage. This pretty diurnal moth is unmistakable, though it is local and mainly western in distribution. Because of its industrial melanic form, more has been written on this species than any other. However our Highland ones are always pale. Occurs anywhere with poplar and sallow. 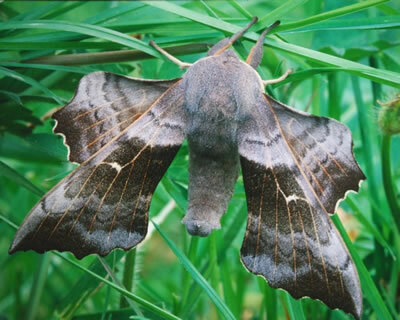 The commonest hawk-moth and our largest resident species, always a favourite at moth-trapping events. Look for it on marshes and grassland with devil's-bit scabious. After a long term decline, this diurnal bee mimic is increasing again in the Highlands, but is easily overlooked. 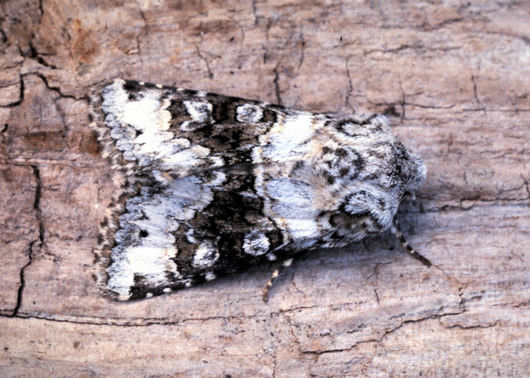 Aptly named from its colour and markings, this common noctuid can sometimes be found on fences and tree trunks. Late May through June, damp moorland and bogs. 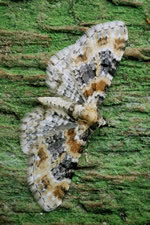 This distinctive moth is a western species in Scotland, matching the distribution of its main foodplant here, bog-myrtle. 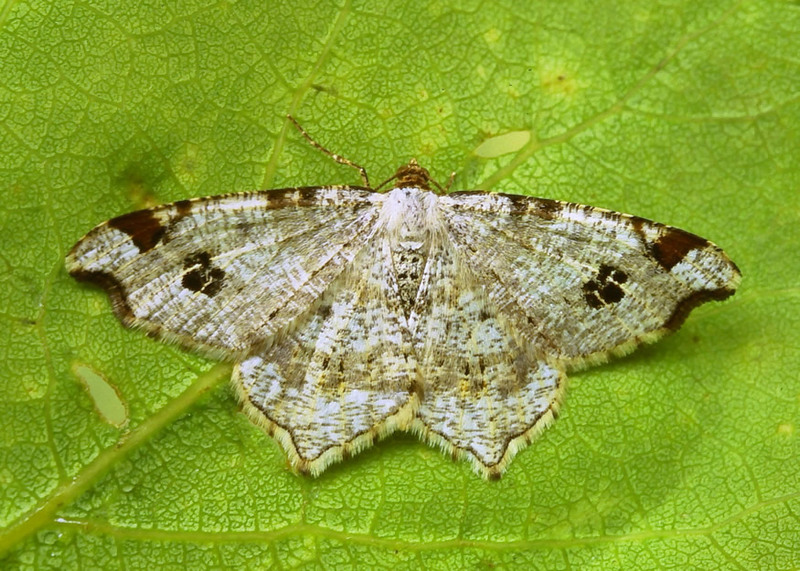 Unlike most carpet moths it is purely diurnal, usually seen when flying in sunshine. The starkness of its black and white pattern suggests warning coloration rather than camouflage. Woodland rides and clearings, anywhere the foodplant is present, including gardens. 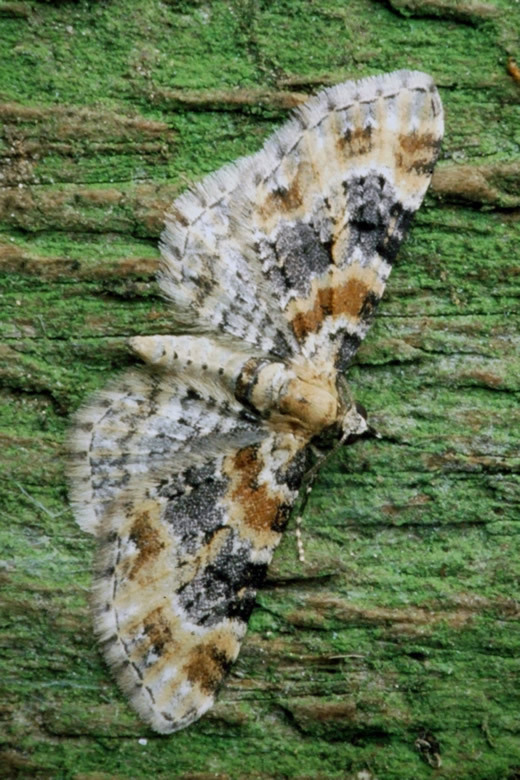 Pug moths are notoriously difficult to identify, but its strong pattern makes this one of the easier species. Foxglove is its only foodplant, but even then the caterpillar is choosy, feeding mainly on the stamens inside the flowers. Late May through June, on open, flower-rich grassland, sand-dunes. A widespread but very local species in our area, this day-flying noctuid is a sign of good habitat. 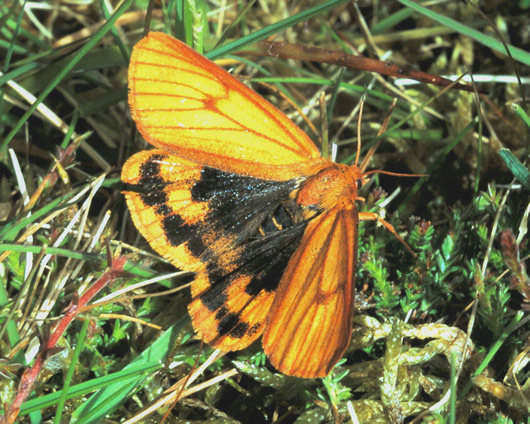 It is active in sunshine, flying close to the turf, but can easily be mistaken for a skipper butterfly. Most habitats including urban areas. At one time, caterpillars of the Magpie Moth were a familiar site, often reaching pest proportions on garden currants and Euonymus hedges. In recent years there has been a major decline and over most of Britain this is now a scarce species - except in north and west Scotland, where huge population explosions sometimes occur on heather moorland. June and July, most habitats including woodland, gardens, farmland. More richly coloured than its migratory relative the Silver Y, this resident plusia is particularly common in Scotland. It can use a very wide range of foodplants as diverse as nettle, cow parsley and garden strawberry. 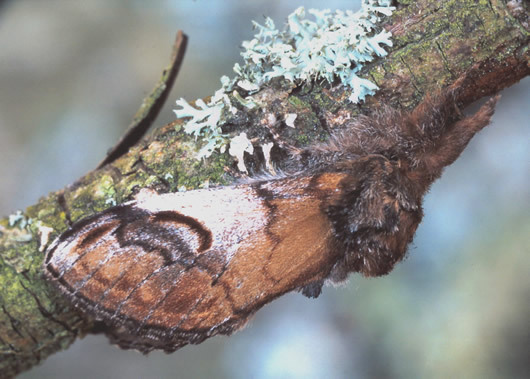 The tufts of thoracic and abdominal hair help the moth's resemblance to a curled dead leaf when at rest by day. Coastal sand dunes, waste ground, arable farmland. Though at the northern limit of its British range here, this chunky little noctuid has quite a stronghold in the inner Moray Firth. 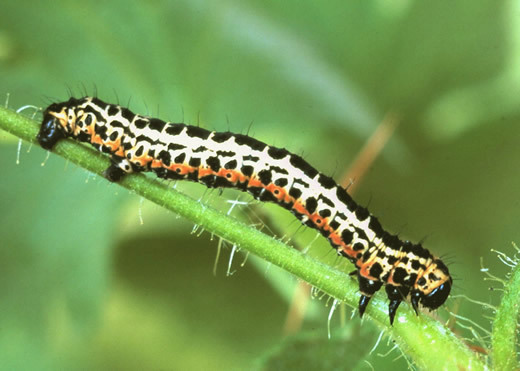 Its caterpillar feeds on the flowers and buds of hawkweeds, sow-thistles and related plants. Occasionally the adult can be found sitting on fence posts. Mid May to mid July. 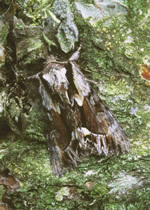 One of the commonest members of its family, Pebble Prominent can be expected wherever sallows or poplars grow. It is easiest to find in the caterpillar stage, however, as the adult is rarely seen except at light traps. Marshes, boggy moorland with sedges and cotton-grass. This small noctuid has a very patchy distribution in Britain. In the Highlands it is decidedly western, being absent from apparently identical habitat further east (much like Marsh Fritillary). Where present it is often abundant, and the adults are easily flushed from the vegetation on sunny days. Late May to early July? Cream Wave is widely distributed in the Highlands, though apparently local and rarely numerous. It can be distinguished from the much commoner Smoky Wave by its wiggly crosslines. Adults rest on foliage and are sometimes disturbed by day. 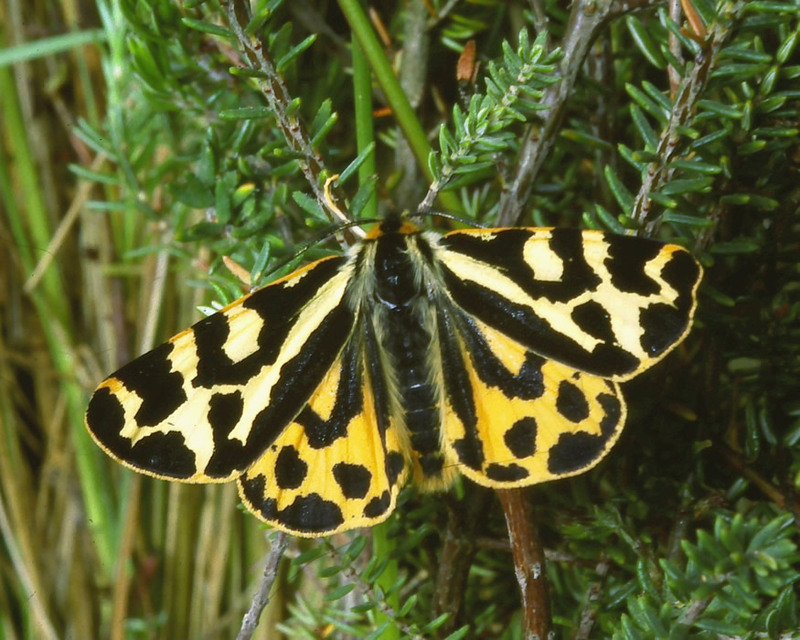 This exotic-looking tiger moth is widely distributed in the Highlands, though local and commonest in the west. 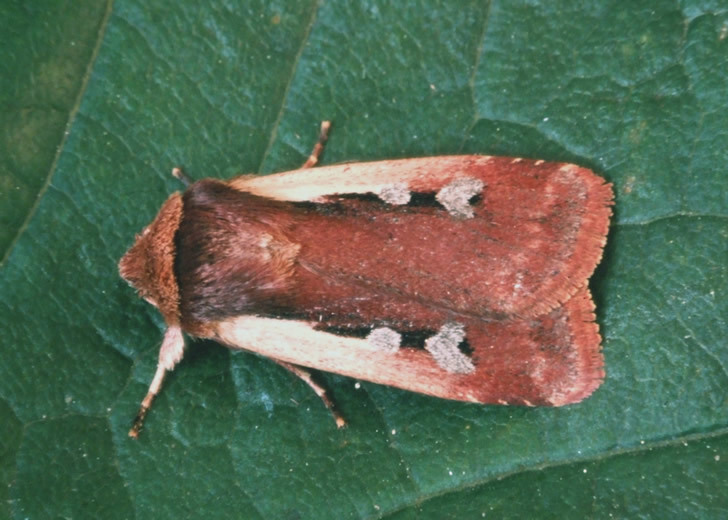 The yellowish male is often active on sunny days, though the redder female (illustrated) is less often seen. June into July (or perhaps earlier?). Scots pine woodland and plantations. 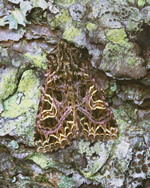 The jagged disruptive pattern of this moth distinguishes it from the various similar carpets. Although its caterpillar feeds on various trees, in our area it is mainly found in birch woods. The adult rests on the trunks but is easily disturbed into flight. Largely coastal in our area. This colourful little hawk-moth is mainly found along the Moray Firth in our area, being scarce inland and absent from the west. Its scientific name translates as "dusk-loving piglet". 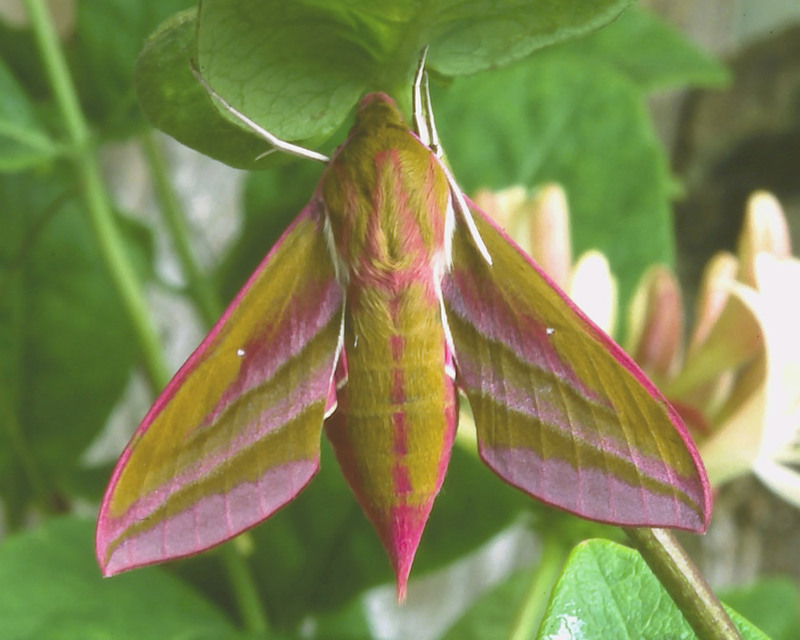 Unlike its larger cousin, Elephant Hawk-moth, the caterpillar prefers ladies' bedstraw rather than willowherb, whether growing on sea cliffs or in sand dunes. Mid May into August, perhaps in two broods. This is one of the commonest of the small but varied prominent family, characterised by the triangular scale tuft on the forewing's trailing edge. Even so, the adult is hardly ever seen except at light, though its caterpillar is frequently found on deciduous trees in late summer and autumn. This is a common species in the west of our area, but scarce or absent further east. While a dingy grey like its name suggests over most of its British range, our Highland ones are almost white and altogether more attractive, perhaps for camouflage on birch trunks. May into August, probably in one extended brood. Arable farmland, suburban gardens, allotments, brownfield sites. 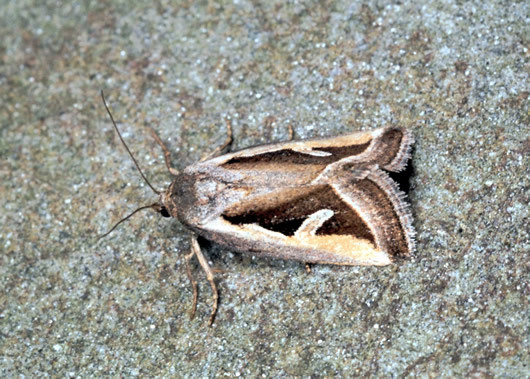 In the southern half of Britain, Cabbage Moth is common enough to be a minor garden pest, but further north it is much less frequent. In our area it is mainly eastern, confined to lower ground, and never very numerous. Its caterpillar feeds on many low-growing plants, though it does have a fondness for the hearts of cabbages. Late May into early August, in one extended brood. Woodland rides and glades, hedgerows, sometimes gardens where raspberries are grown. No other British moth resembles this, making it genuinely unmistakable. Its pattern presumably aids concealment when resting in dappled shade, for it is rarely found by day. At dusk it flies quite slowly, visiting 'sugar' and honeydew more than flowers, but not often coming to light. Woodland, meadows, road verges, rural gardens. 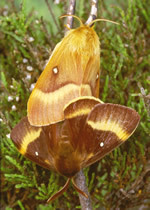 Though absent from the higher ground, Flame Shoulder is a common species throughout Britain, with its caterpillar feeding on numerous low plants such as dockens. While double-brooded further south, in our shorter northern summers it has one extended single brood instead. The adult hides in low vegetation and is rarely found by day, but is often abundant at 'sugar' and in the light trap. A particularly colourful individual is illustrated here. Damp woodland, wet moorland and carr. The kittens are much smaller relatives of the Puss Moth - perhaps a rare attempt at humour in the normally serious business of nomenclature! Of the three British species, only Sallow Kitten is found in Scotland. 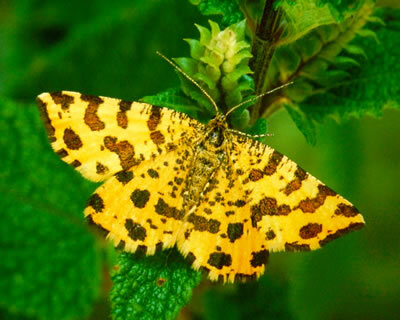 As its name suggests, the main larval foodplant is sallow, including small bushes of Salix aurita in moorland as well as taller trees in woodland. Like most prominents, caterpillars are easier to find than the adults, which are rarely seen except in light traps. 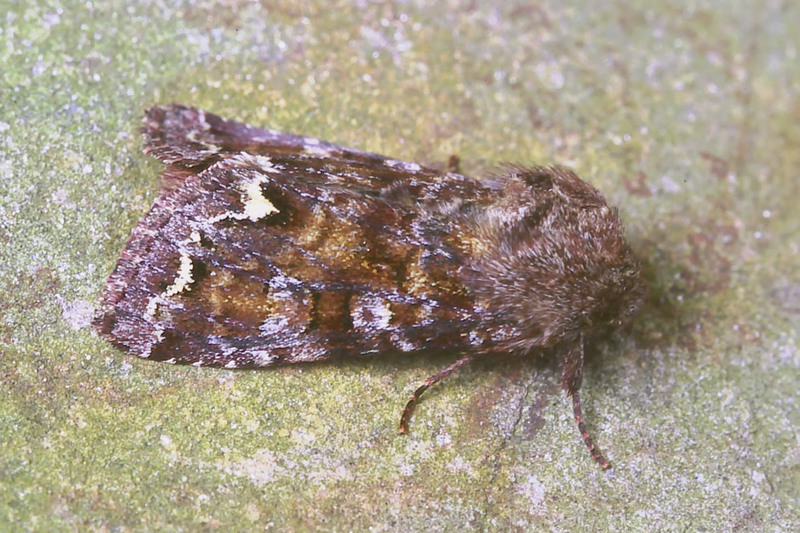 This is another species associated with sallow, occupying similar habitats to the last. However, it is more widespread and numerous, as well as being readily found by day. Again, in Scotland there is one extended brood, compared with two broods further south. Adults rest in the foliage of trees and bushes and are easily disturbed into flight. At night they are strongly attracted to light, but less often visit flowers or 'sugar'. This ubiquitous and very common species is dimorphic, with the dark form combusta almost as frequent as the pale typical form. The caterpillar feeds nocturnally on various grasses, enabling it to remain active during mild spells throughout the winter. In spring it feeds up quickly on the fresh new growth. Despite its numbers, the adult is rarely found by day because it rests concealed. After dark it is particularly fond of sugar, as well as floral attractions. 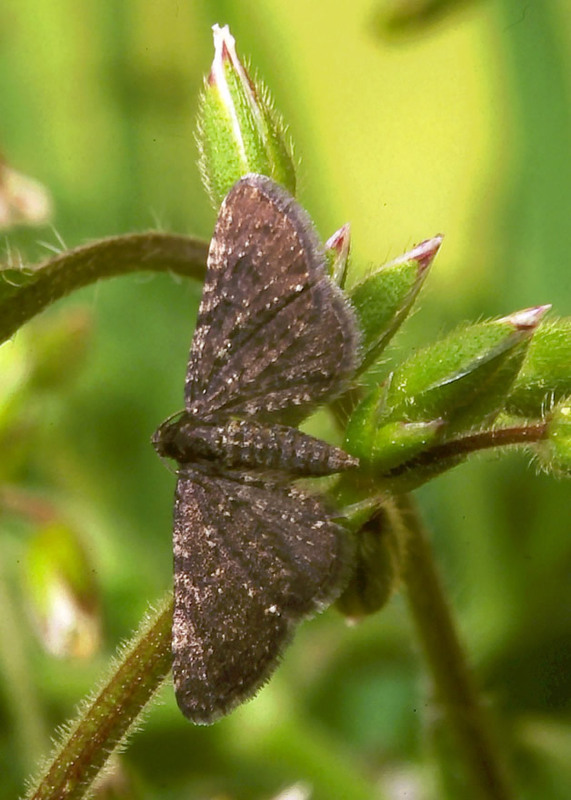 This distinctive little moth rests openly on the upper surface of leaves, suggesting it is relatively unpalatable. Its simple two-tone pattern lacks the subtleties seen in moths that accurately mimic bird-droppings, so perhaps this has a shape-disrupting function. Sallow and aspen are the main larval foodplants. 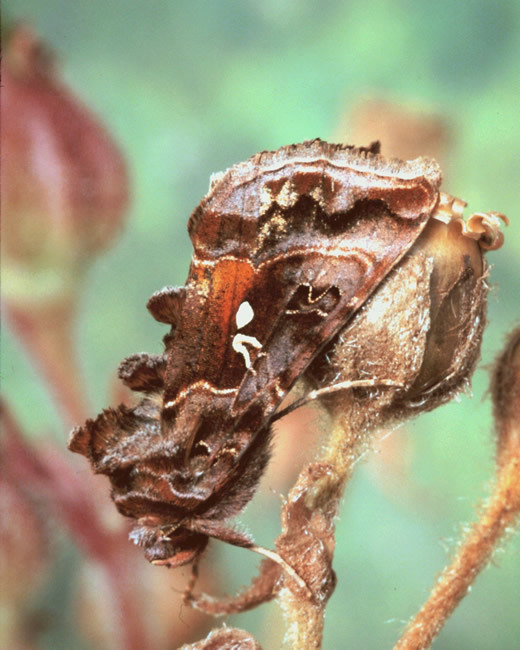 Adults can often be seen sitting on their leaves or on surrounding vegetation, though they take wing readily if disturbed. Mid June to early August. Woods, scrub, moorland, hedgerows, gardens. This moth is so variable that early lepidopterists thought several of its forms were separate species. 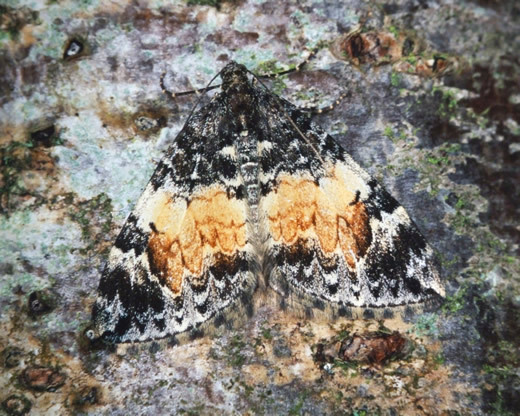 The one shown here was known as Yellow Marbled Carpet. 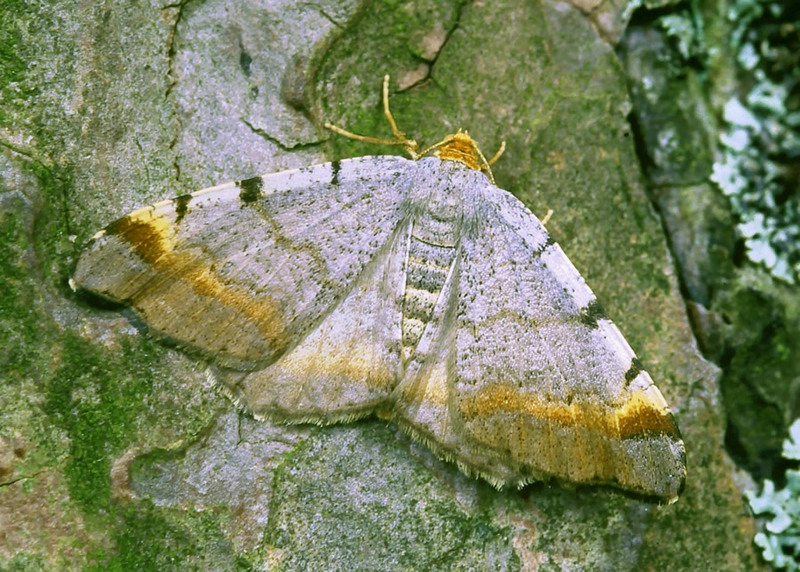 Other forms lack the orange-yellow and can be hard to distinguish from the related Dark Marbled Carpet. Date can be a useful clue. 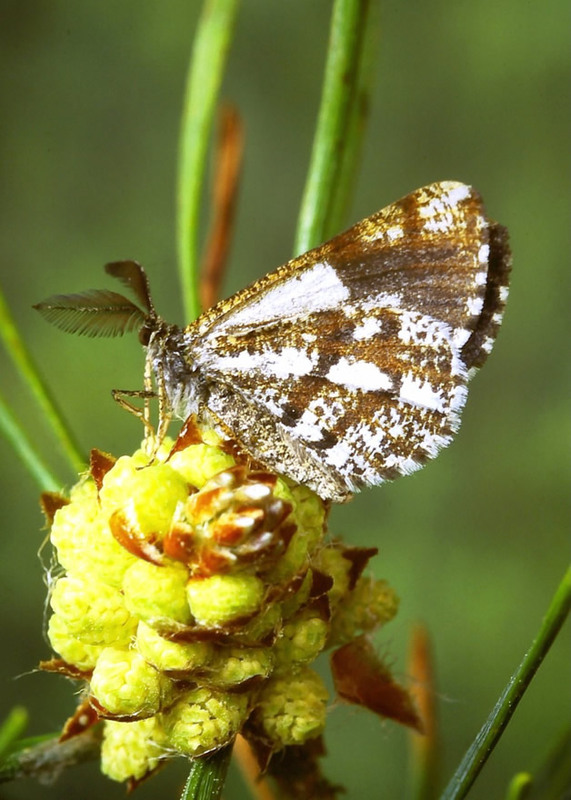 Because the present species overwinters as a caterpillar it is on the wing earlier in the summer than the latter, which overwinters as an egg - though there is some overlap. 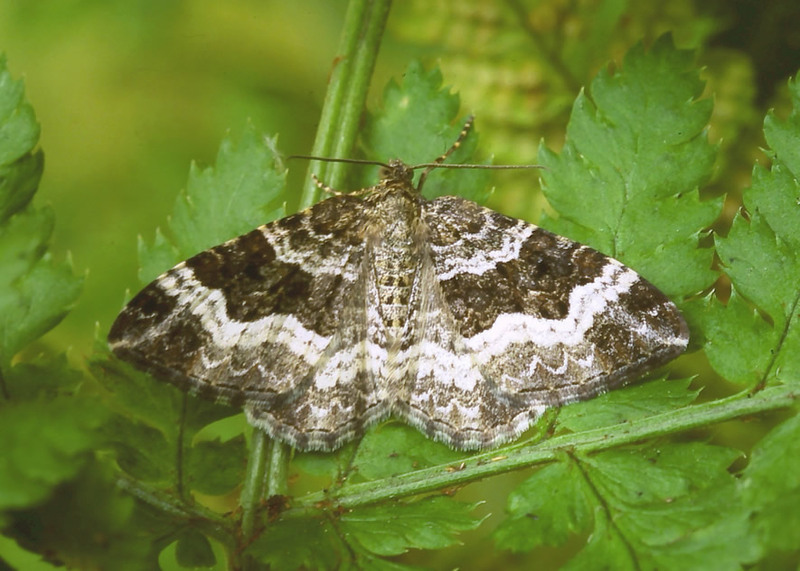 As its name suggests, Common Marbled Carpet is found almost everywhere, having a wide range of shrubs and herbs as foodplants. Adults usually rest on tree trunks but can be very difficult to spot. In the Scottish Highlands this species is often pure white, explaining why Linnaeus named it after the Mountain Hare in its winter coat. In southern Britain the moths are much greyer. Though widely distributed, Miller is normally seen only as occasional singles even in the most favoured areas. Why some widespread species are abundant and others exist at low density is a mystery not easily explained in terms of resources or habitat quality. 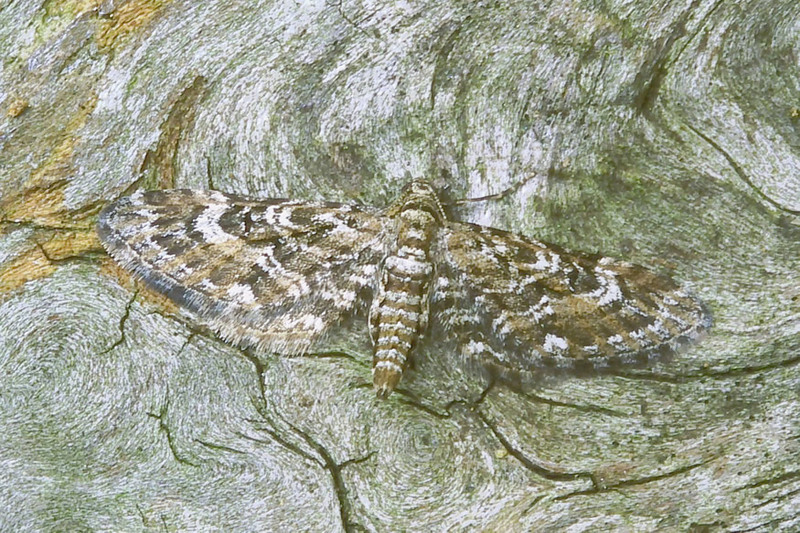 Very occasionally the adults can be found at rest on tree trunks, but sightings are notable even at moth traps. 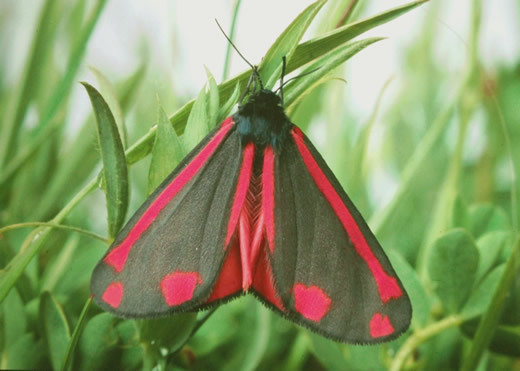 In our area, Cinnabar is resident only in southern parts of the west coast, though it seems to be extending its range northwards following climate change. Its larval foodplant, Common Ragwort, is certainly available. The adult is is a partial migrant, with several records in Orkney. Both the caterpillar and the adult are among the most unpalatable of all our moths and their warning colouration strongly reflects this. Moths fly slowly and are active (or at least easily disturbed) by day, though night is their main time of activity. Where present, the caterpillars are often so numerous as to demolish their foodplant. Adults too can be numerous, though numbers may vary greatly from year to year. Curiously, the adult's aposematic crimson, so dramatic when fresh, fades to pink within a few days. Perhaps by then it has served its purpose. This ubiquitous and abundant species is not limited by foodplant, for its caterpillar eats a wide range of low plants and grasses. As with many species that are double-brooded further south, in our area there is one extended brood, although in particularly good summers a partial second brood appears in autumn. 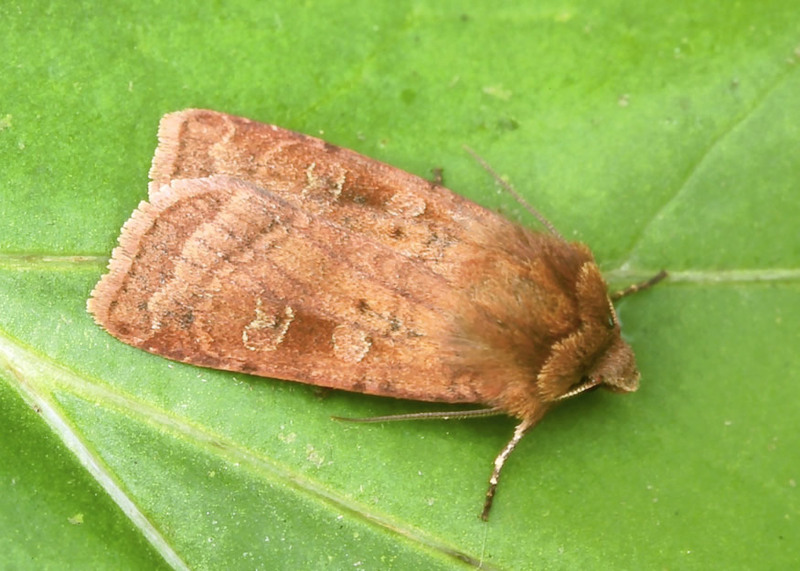 Small Square-spot is similar to several related species, but the terracotta colour and simple pattern on the rather plain forewings are a good clue to its identity. Despite its numbers, this species is hardly ever seen by day. Its caterpillar feeds nocturnally, hiding in the leaf litter at dawn. 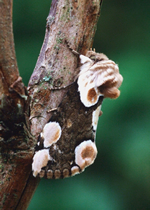 The adult likewise rests concealed, but can often be found in dozens after dark at nectar sources, sugar and aphid honeydew, as well as in the light trap. 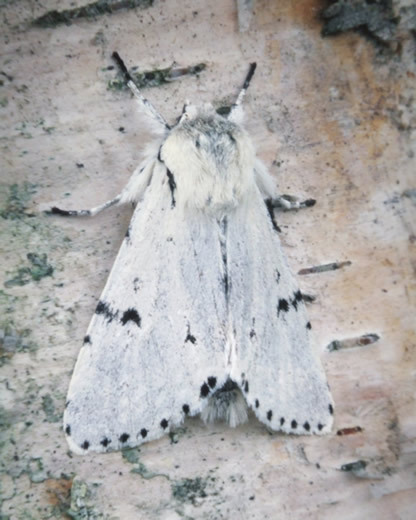 As a group, moths associated with birch tend to be particularly attractive and distinctive. Pebble Hook-tip is no exception, with its unusual falcate forewings and striking yet delicate markings. Our Highland ones are of the scotica race, with an almost white ground colour instead of the duller ochreous-brown of further south. Although widespread, this is a local and low-density species, rarely seen in numbers even in the best birchwood habitat. 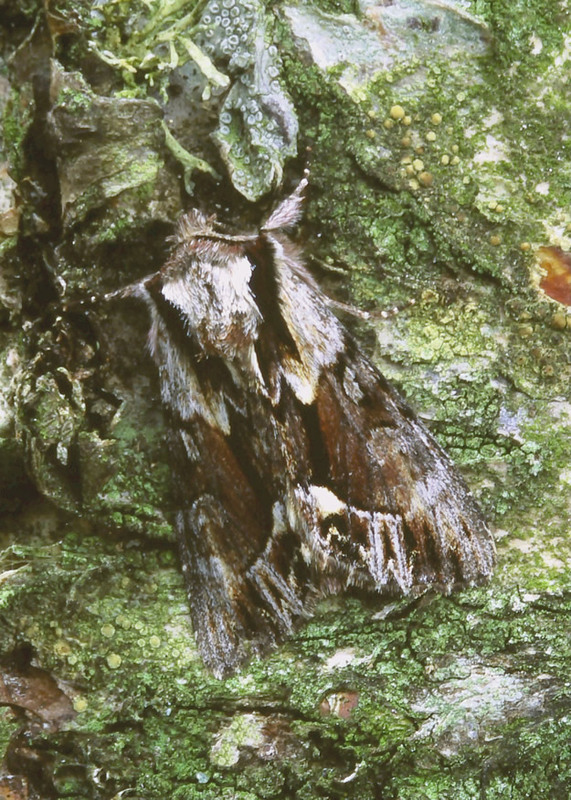 By day it is occasionally found at rest on trunks or foliage, but most sightings are from light traps. Since adults in this family are unable to feed, nectar sources have no attraction for it. This is one of our scarcest moths, so excessively local that it has Red Data Book status. Its caterpillar feeds on the flowers and seeds of sea campion growing on rocky cliff ledges. Such habitat occurs on many parts of the Scottish coast, but for reasons yet unknown the moth itself is far more restricted. It is local and scarce elsewhere in Europe too, though not particularly coastal. 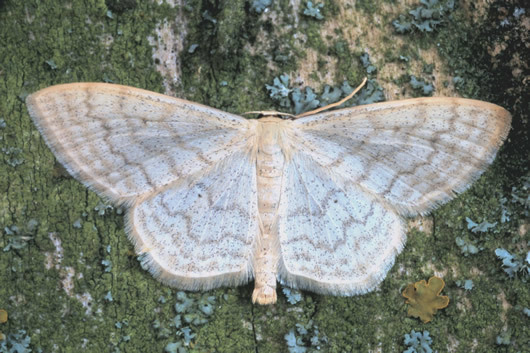 Though its rarity makes it a desirable find, the moth's appearance can best be described as subtle. As its name suggests, this is not a colourful species, particularly in Britain. Yet the underlying bluish tint of fresh individuals is distinctive enough in its own way. 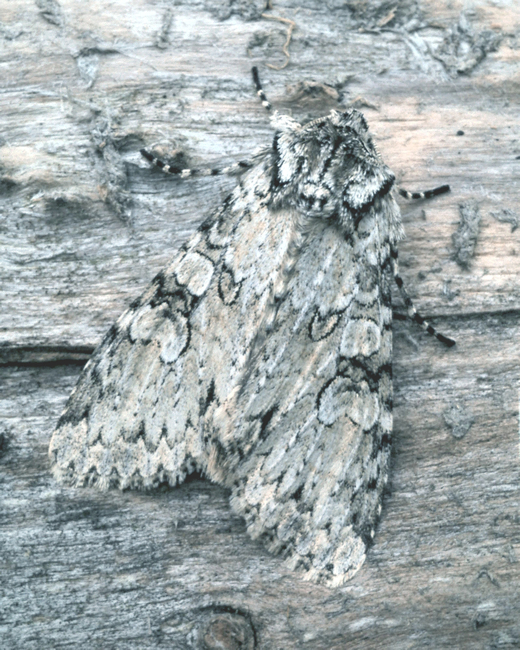 The adult comes to light traps or can be netted while nectaring at campion flowers after dark, when the weather in its exposed and rugged haunts permits. Lead Belle and July Belle are very similar species, only separated from each other in the late 1930s. They are still often confused. Lead Belle is the scarcer and more local in Scotland. It certainly occurs inland in the central and eastern Highlands, but records from coastal sites or from southern Scotland may be questionable. The distinguishing features of Lead Belle include the comma-shaped discal spot, the more noticeable serrated submarginal line and the more closely-spaced crosslines. A classic female is illustrated here. However, some individuals of each species are ambiguous and flight periods also overlap, causing particular problems when both occur at the same site. Where present, Lead Belle may be numerous. It is easily disturbed from the heather and gorse by day and is perhaps partly diurnal. Heather moorland, other open habitats. Broom Moth is most often seen in the larval state, as a distinctively striped caterpillar sometimes feeding openly by day (see September 2012). The adult is on the wing in one extended brood between late May and early August, but is rarely found at rest. 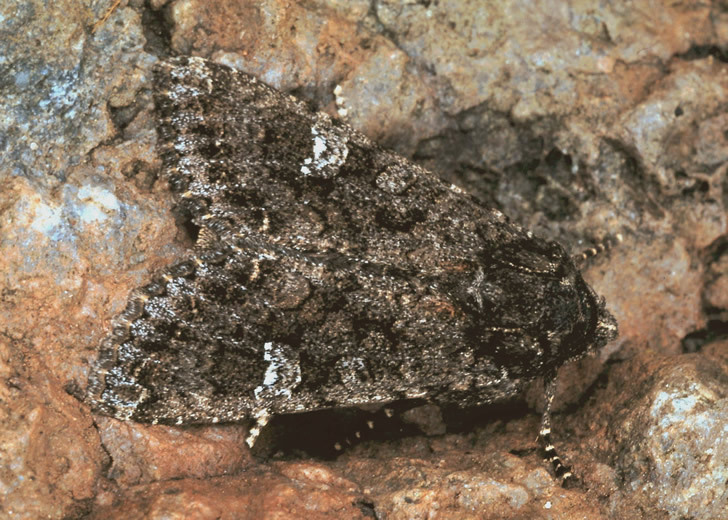 Like many similar noctuids it has a general-purpose mottled and marbled camouflage, enabling it to spend the day in low vegetation such as heather or concealed in other nooks and crannies. The pale yellow, jagged submarginal line is its most distinctive feature, separating it from various similar species. Scottish examples are particularly richly coloured. Since aspen is its only foodplant, Poplar Lutestring is inevitably local like the tree itself. On top of this, the moth has a disjunct distribution within Britain. Its main populations are in southern, central and eastern England and then the Scottish Highlands, with very few sites in-between. In our area it is commonest amongst the aspens of the Spey Valley and along the Great Glen. Perhaps the easiest way to record this species is as a larva. The caterpillar shelters between two aspen leaves that it spot-welds together with pads of silk. With practice, these distinctive dwellings are relatively easy to find in August and September. The adult itself is far less often seen. It is hardly ever found by day, probably resting high up amongst the aspen twigs. At night it comes to light traps and to sugar, but normally in small numbers. 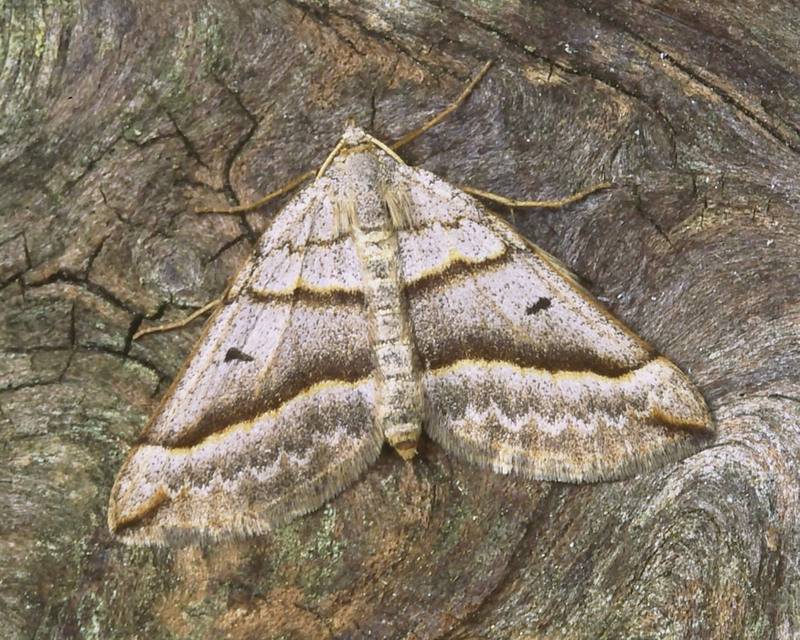 Our Highland moths tend to have a purplish grey tinge when fresh. They have been named subspecies scotica, though the differences seem too slight to merit this. 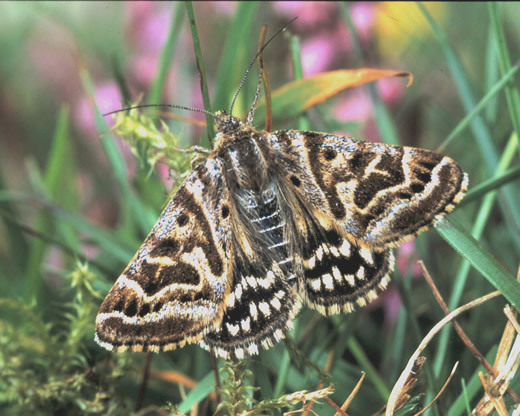 This fine large moth is most numerous on heather moorland but occupies a wide range of other open habitats, though it seems less common on the coast. 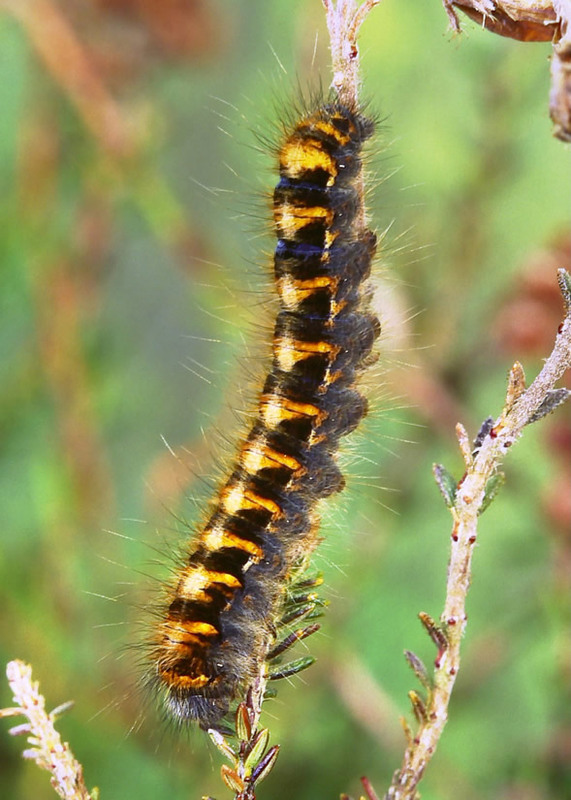 Its caterpillar feeds on heather and many other shrubs and trees including birch and sallow. 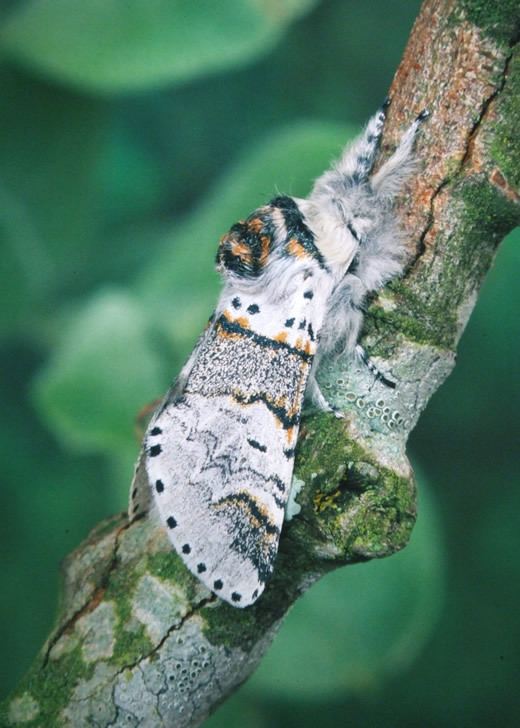 The life cycle lasts two years, with the first winter spent as a small caterpillar and the second as a pupa, making it one of very few moths able to hibernate in two different stages. 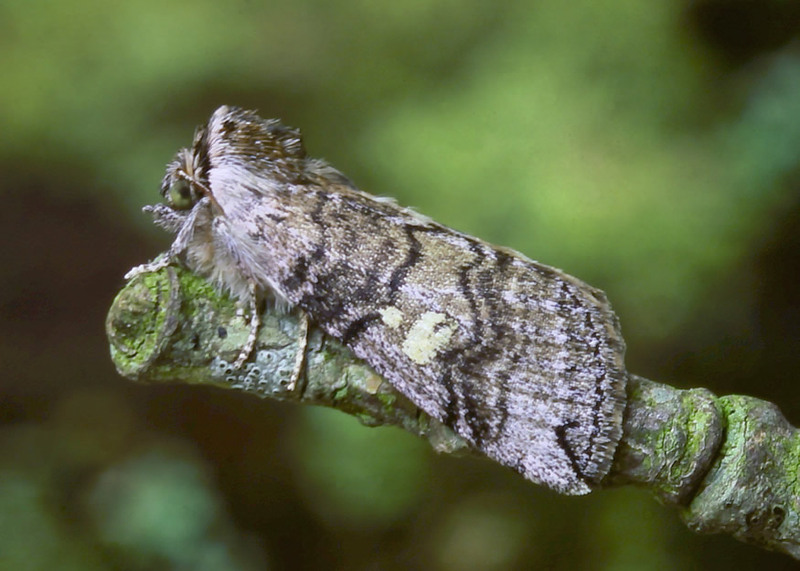 A curious effect of its two-year life cycle is periodicity: adult moths are far commoner in alternate years. In some regions moths fly mainly in odd-numbered years, in others they fly in even-numbered years. 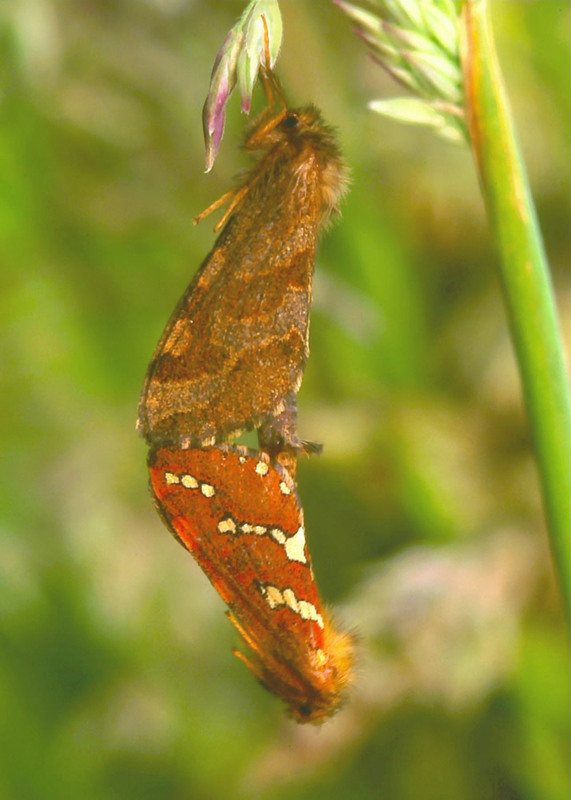 It is thought that this synchronisation is brought about by the moth's relationship with its parasitoids creating a continual leap-frogging effect. In Britain south of the Wash this is a common woodland species, feeding on hazel and a range of other trees and shrubs. North of this line it suddenly becomes far more local. In Scotland the few records are sparsely scattered, yet provide no obvious clues as to why the moth is so scarce here. 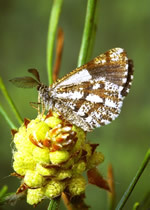 The only photographs in the Scottish digital voucher archive (see BC East Scotland Branch website) are from East Ross and Caithness, indicating climate is not a limitation, yet the moth's apparent absence from the favoured Deeside, Speyside and Great Glen areas does not suggest a need for prime habitat. 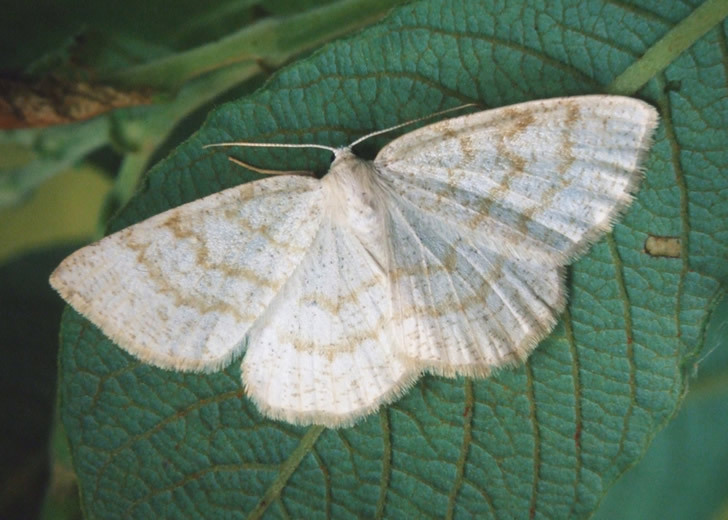 Because it flies mainly in the early evening, Small White Wave is not often caught in light traps, thus it may be overlooked to some extent. Even so, it must be one of Scotland's scarcest resident moths, far harder to find than most of the famous Scottish rarities. The Saxon is widespread but local in our area. It is an indicator species of better than average habitat, often with bilberry, a larval foodplant. Even where present the moth is seldom numerous, making it always a welcome find. The adult rests openly, trusting in its disruptive camouflage, which is particularly effective on birch trunks though less so on fence posts. However, most records are at light traps or at sugar. 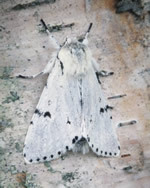 As with The Gothic, the vernacular name is said to be an architectural reference based on the moth's arched markings. Widespread on inland moorland, mosses and coastal heath. Wood Tiger has undergone a long and severe decline in southern Britain, but it is still widespread in our area where suitable habitat remains. The adult's striking pattern serves several different functions. 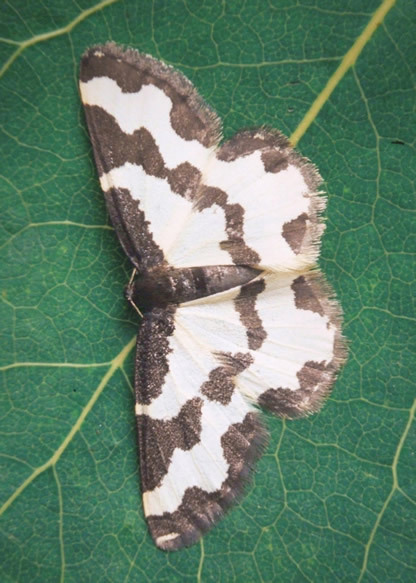 Like other tiger moths, Wood Tiger is warningly coloured to deter predators, but the black and cream forewings also act as disruptive camouflage, making resting moths almost impossible to spot amongst low vegetation. Once disturbed into flight, their deep yellow hindwings create flash colouration, confusing the eye. Thus the moths are surprisingly hard to follow in bright sunshine and many of my own sightings have been frustratingly brief. Being entirely diurnal, Wood Tiger is not attracted to light, nor to sugar and nectar sources since it cannot feed. When recording this species there are no alternatives to proper fieldwork. This is a local moth with a very disjunct national distribution, even though apparently suitable habitat occurs far more widely. In our area it is found on cliffs along the southern coast of the Moray Firth, yet seems absent from the north and west. The larval foodplant is thrift, but only the stunted ‘bonsai’ plants growing on warm, south-facing cliff ledges are used. Its grub-like caterpillar bores out the stems, eventually killing whole sections of the clump. This feeding damage is very obvious by April. Adults fly in sunshine, the hotter the better. They are very active and easily overlooked amongst the numerous small flies and other insects also present. However, they are conspicuous when nectaring on the bright yellow centres of mayweed flowers. Woodland edge, scrub and carr. 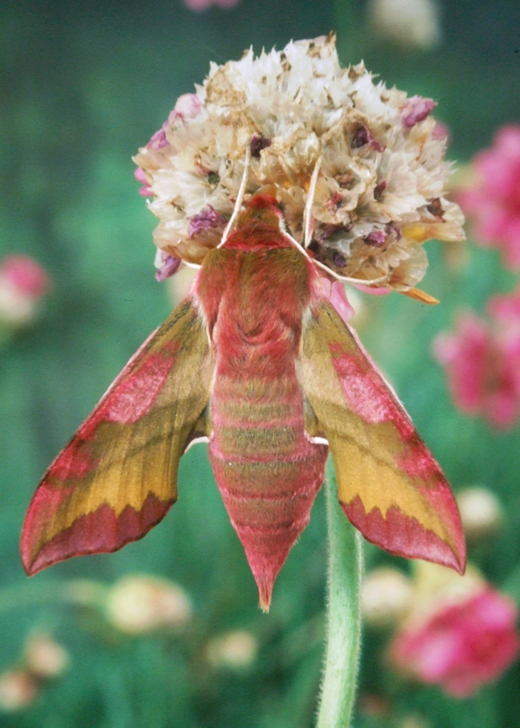 In most moths, the female attracts a mate by releasing pheromones. Gold Swift uses a different system known as lekking. Groups of males perform communal display flights in early evening and females presumably choose the one that most appeals. 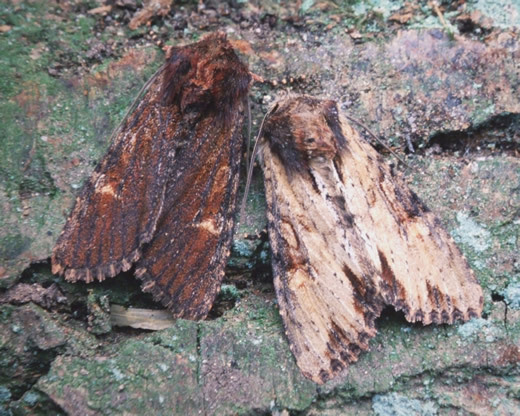 Though the selection process itself is rarely witnessed, pairs remain joined for quite some time and are often found where the moth is numerous. The caterpillar is a different matter. It is subterranean, feeding on the roots of bracken and a wide range of other plants, so is rarely seen. Damp deciduous woodland, often with bilberry. This is by far the smallest and most dainty of our emerald moths. 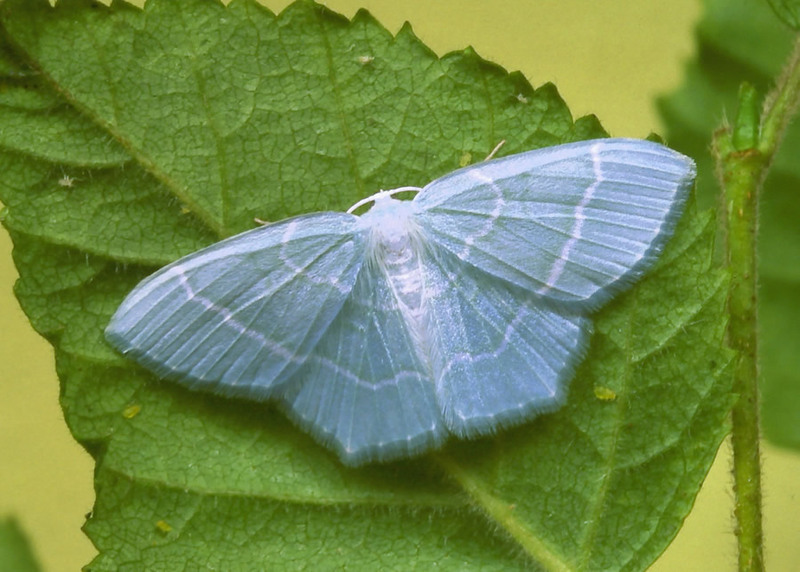 Even its colour is ephemeral, the delicate pale blue-green fading almost to white within hours of the moth’s emergence. 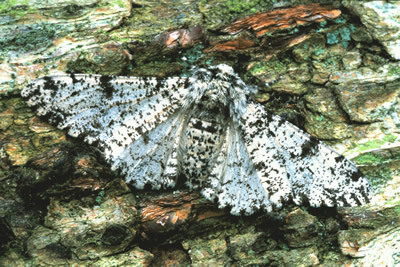 Perhaps the pigment serves to camouflage the moth while it is expanding and drying its wings, but need last no longer. Little Emerald is local and western in Scotland, most frequent in Argyll but reaching West Ross. Quite possibly it is under-recorded. 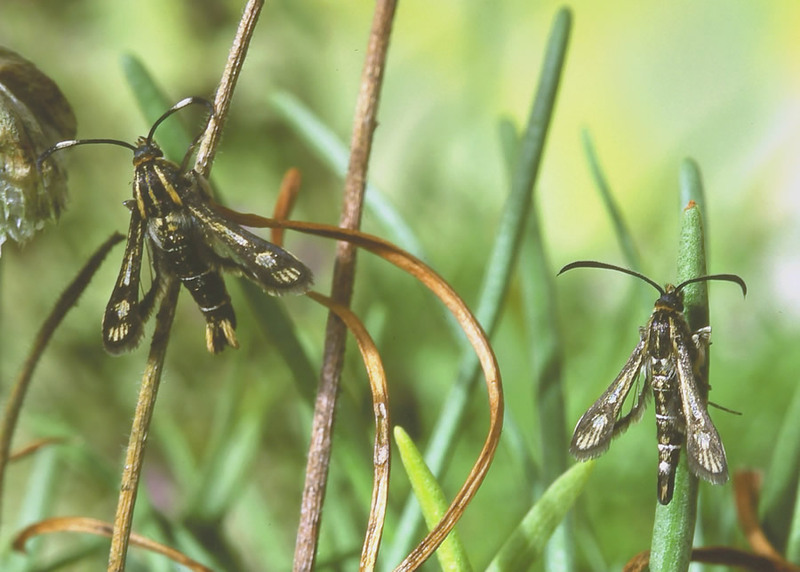 Surely it must be present in West Inverness-shire too, still awaiting discovery in remote woodlands that have never been properly worked for moths? Though widespread, this is a local and low-density species, an indicator of particularly good habitat. It is rarely if ever seen in numbers even at mercury vapour light traps. 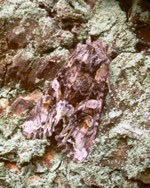 Though similar to several other related brocades, it can be distinguished by its greyer ground colour that is often tinged with pink, and by the pale markings that combine to form an X-shape when the forewings are closed. Nevertheless, a voucher photograph will normally be required by diligent County Moth Recorders. 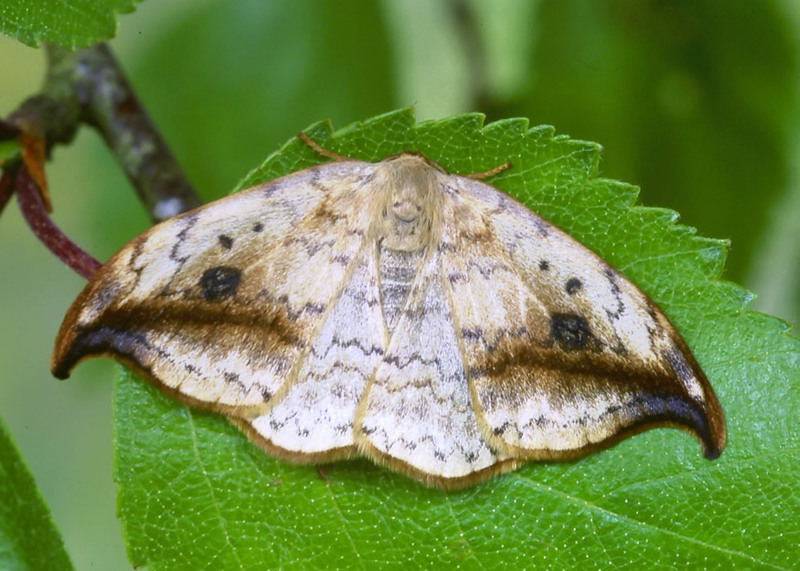 Though almost certainly single-brooded in our area, Tawny-barred Angle has a very long flight period, with moths on the wing from late May through to August. Since pines are not deciduous, its caterpillar does not have to complete its growth before autumn leaf fall. When freshly emerged this is an attractive moth, with orange bands on a lilac-grey background, but these pastel colours soon fade. In southern Scotland a melanic form is common, but this is apparently absent from the Highlands. The adult rests on pine trunks and branches, or sometimes in the ground vegetation beneath. Although present in virtually every pine wood and plantation it is not numerous, and even Forestry Commission Scotland do not currently regard it as a threat. Presumably this moth obtained its English name because its shape vaguely recalls that of the Peacock butterfly, but there are no other similarities. 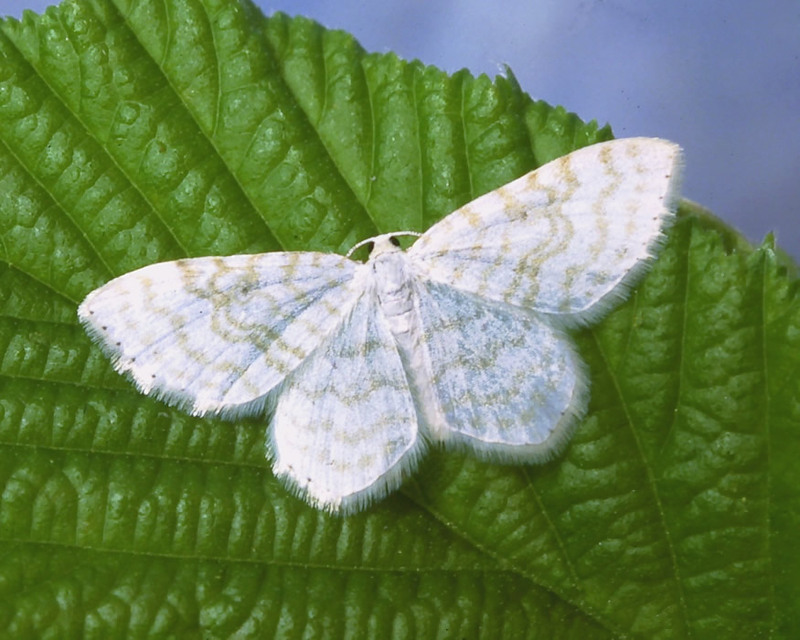 Unlike the butterfly, the moth is cryptically coloured, resembling a pale dead leaf. It rests amongst foliage, especially that of its foodplant, birch, but is easily disturbed into flight during the daytime. This species has a curiously disjointed distribution in Britain, being found in southern England and south Wales, then again in Scotland north of the central belt, with a big gap in between. In the Highlands it is mainly western. After an increase in numbers and some spread in recent years it now gets into western Banffshire, but is still absent from apparently ideal habitat in Aberdeenshire. 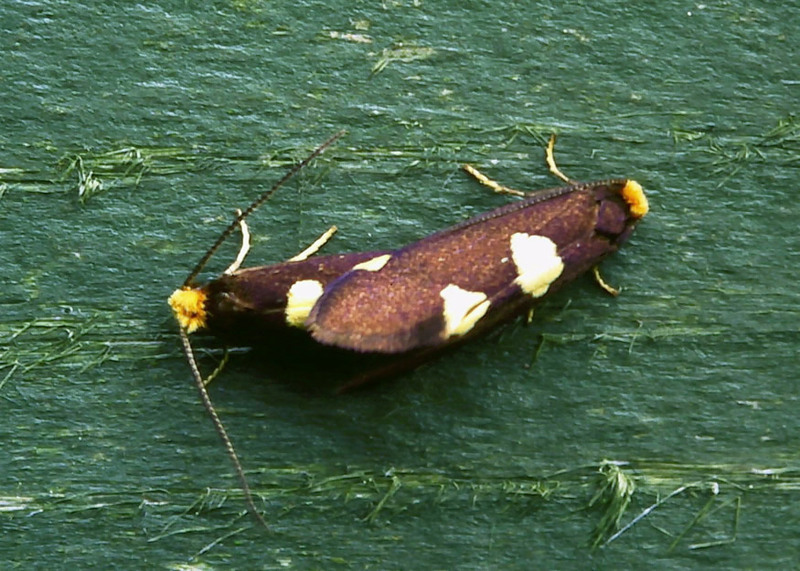 The natural foodplants of this striking little micro-moth are given in the literature as bilberry and cloudberry, but in my garden it seems to be associated with fruit bushes such as gooseberry and raspberry. The guide books mention little about the adult’s behaviour, but it seems to be diurnal, as this mating pair found on my garden shed shows. Larva fully fed in June. The adult often emerges in January, so usually this is my first moth of the new year if hibernating species are excluded. Like others that emerge at this season, the female is flightless, and when her eggs hatch the larvae must disperse on silk threads that catch the breeze. 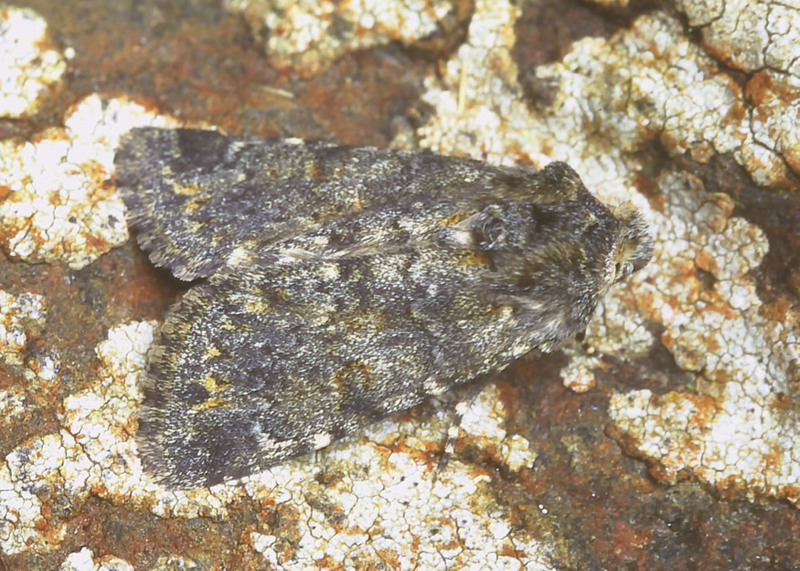 Given the uncertainty of this method of dispersal, Pale Brindled Beauty has by necessity a very wide range of foodplants, being able to feed on almost any deciduous tree or shrub. 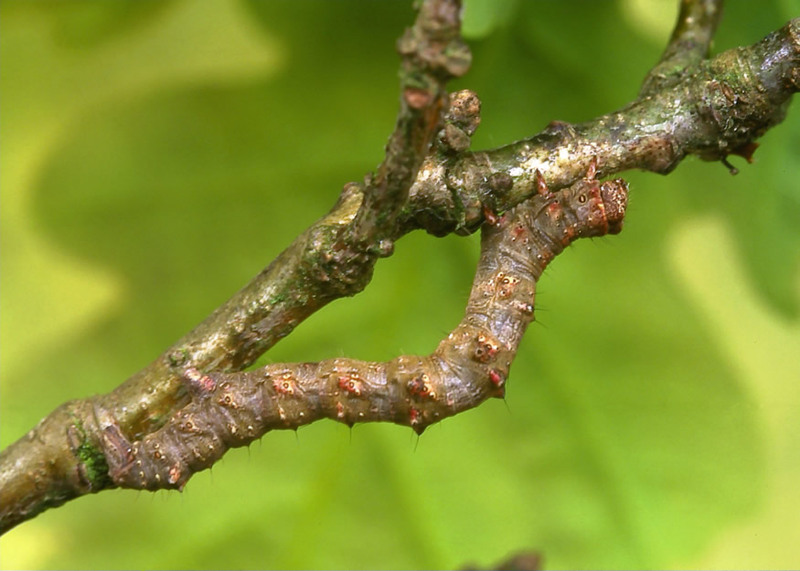 Likewise, the caterpillar is a generalised twig mimic, best distinguished from others in the Ennominae subfamily by the prominent warts each bearing a single bristle. 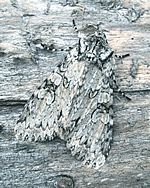 Despite its camouflage, feeding damage betrays its presence, making it a frequent find in June. 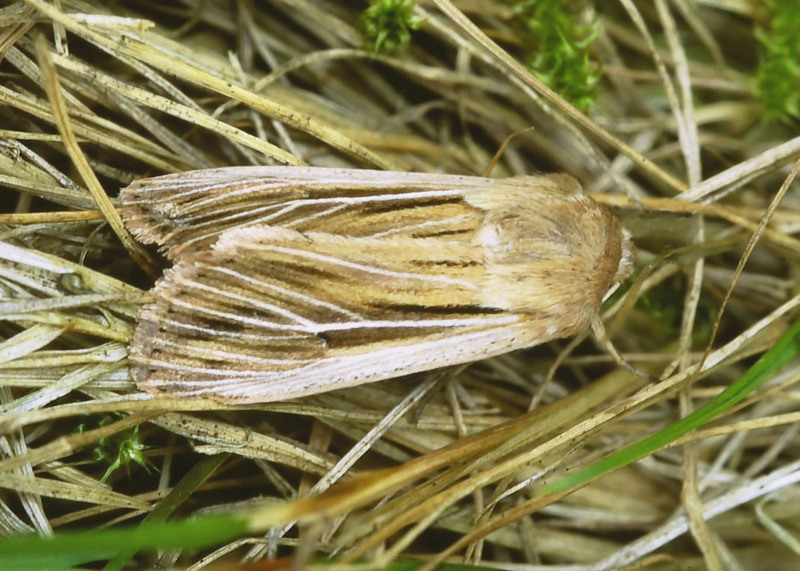 In our region, Shoulder-striped Wainscot is an eastern species, well-distributed in the Inner Moray Firth but far less frequent further west. Perhaps its most favoured habitat is grassy sand dunes as at Findhorn, but even here it is never a numerous moth. Away from the coast it is far less frequent, turning up as occasional singletons at long intervals. Judging by its wing pattern, the adult probably rests by day amongst fine-leaved wiry grasses, but the chances of finding it are low. Most records are from light traps, or occasionally at sugar. 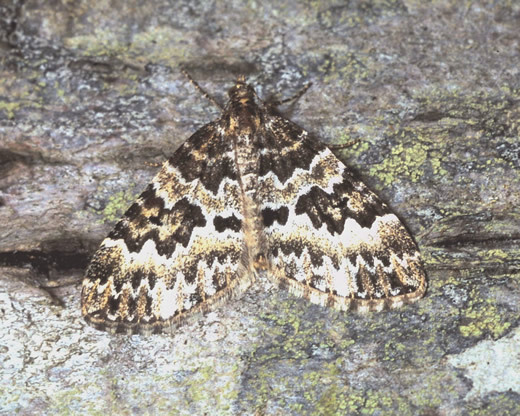 This is one of the more distinctive of the many pugs, with a well-marked pattern of white and dark grey alternating stripes across its narrow forewings. Despite its specific name of dwarf (nanus) it is of average size for this group. Almost any heather moorland is sure to have this species. Heather and heath Erica are its only foodplants. Its surprisingly long flight period (apparently as one single extended brood) gives plenty of opportunity for recording it even on daytime visits. The adult is easily disturbed from the heather, and also rests on fence posts, but once in flight it is soon swept away by the breeze unless the day is calm. Late May to early September. As its name suggests, Common Carpet is both ubiquitous and numerous, present virtually everywhere that its bedstraw foodplants occur. Woodland rides, marshes, moorland, herb-rich grassland whether coastal or inland all support this species. Although the adult flies mainly at dusk and after dark, it is very easily disturbed from the sward by day, usually flying a short distance before settling openly. This makes it easy to record even on a casual visit. 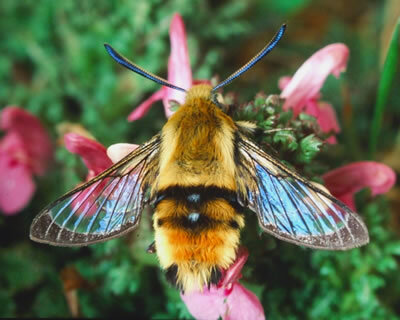 The very long flight period reflects the moth’s tendency to emerge later after cool springs and in poor summers. A partial second brood is probable in good years at favoured sites, but is certainly not the norm in our area. Meadows, road verges, marshes, coastal grassland. Marsh Pug seems to be mainly an eastern and lowland species in Highland region, and also rather local. It is also very easily overlooked because of its small size and diurnal habits. This means it is rarely caught in light traps. Nor is it conspicuous or easily recognisable on the wing, since its flight is very similar to a micro such as a tortricid. A further difficulty is that its colours and markings soon bleach in the sun, making identification difficult. Almost certainly Marsh Pug is under-recorded even at sites where it does occur. The flowers and seeds of mouse–ear chickweeds and probably stitchworts are the caterpillar’s foodplants, so this species can survive in permanent pasture as well as in more natural grassland. The adult does not fly far from its foodplant, and sometimes nectars on the flowers. Roadsides, woodland rides, damp grassland, waste ground, brownfield sites. In 1980 there were only three dots on the map for this species in our region, but a major range expansion was already underway in Scotland. Today, it is found as far north as Caithness and has reached the Outer Hebrides, though not yet the Northern Isles. While climate change must have been a factor, the spread of Rose-bay Willowherb, an American alien, along railways and road verges must also have helped by providing a vast new source of foodplant. 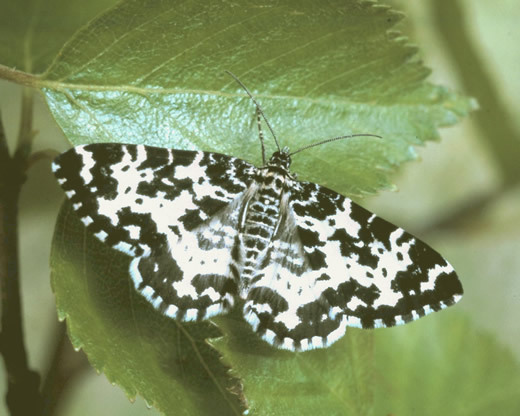 The adult can occasionally be found by day resting on low herbage, but is more easily seen while nectaring at dusk, often at garden honeysuckle or campions. The caterpillar is also conspicuous on roadside willowherb later in the year, reaching full growth as the lower leaves begin to wither and expose it to view. The Campion, as its name suggests, is one of a group of related noctuids whose larvae feed on the unripe seeds of campions. Though able to utilise them all, each moth tends to specialise on one particular species, possibly to reduce competition. This one is associated with Ragged-Robin, hence it favours marshy habitat, often inland and slightly acid. In our area it is perhaps commoner in the west. The adult is rarely found by day, but is strongly attracted to the nectar of its foodplant at dusk, helping to fertilise the flowers that provide the seeds for its own progeny to eat, a neat arrangement. Because the seedpods of Ragged-Robin are quite small, the caterpillar can only live inside them during its early instars, but when larger must hide at ground level by day and ascend the stalks to feed after dark. 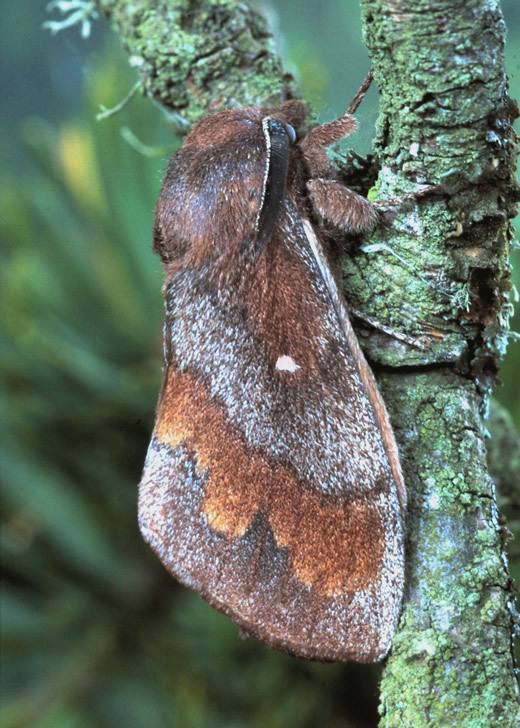 To the forester, this moth (or at least its caterpillar) is the Pine Looper, considered a pest because of the damage it can do in the simplified habitat of single species, single-age plantations where natural controls such as wood ants and insectivorous birds are few. In the native Caledonian pine forest such dangerous increases in numbers sufficient to cause damage seem not to occur. The male flies by day in the sunshine, trying to locate the female using its plumose antennae. The striking black and white pattern of its upperside indicates warning colouration, suggesting it is unpalatable to birds. 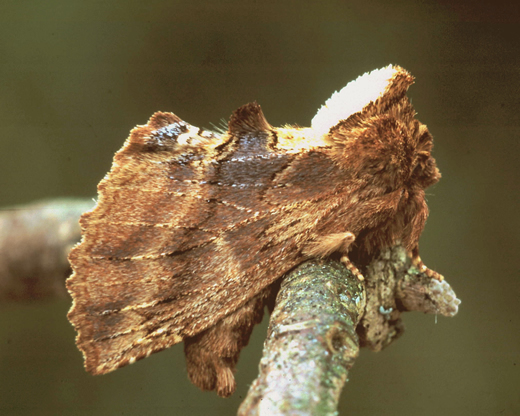 However, the moth only exposes this upperside in flight, always resting with its wings closed over its back. By contrast, the caterpillar goes for camouflage instead, greatly resembling both in colour and shape the pine needles amongst which it rests.